UPDATE: As of July 2012, Trichy Dosa is now Sherpa Nepalese. Poppadoms, curry, rice, naan bread: standard Indian fare. Dosa and idly? If you live in the UK, probably not so much. Since the opening of Trichy Dosa in late 2011, these staples of South Indian food can now be found on the Cowley Road, so there's no excuse to limit your repertoire. I first encountered a dosa in Malaysia. The large, thin savoury pancake didn't say 'Indian food' to me so much as it said 'smear me with nutella and devour me like Lent starts tomorrow'. (Well, to be honest, it didn't say anything - it was a pancake). Devour it I did though, dipped in the sauces it came with. And it was love at first bite: for the rest of my stay, a dosa a day was an essential requirement. Served solo or filled with vegetables, cheese or meat, these pancakes made of rice batter and black lentils are simple yet delicious if done well. Needless to say, I was pretty excited at the prospect of a visit to Trichy Dosa. The restaurant itself is unremarkable; a plain Jane making no mark on the design scale. The leather-backed chairs are decent, but the lack of tablecloths cheapened their look somewhat. The neutral effect inspired by the bland decor was cancelled out by another type of decoration, though: decorations of the Christmas variety. Yes, at the beginning of February, tinsel still adorned Trichy Dosa's walls. Epiphany rules may not apply here, but for me it suggested a lack of care and lent an oddly unseasonal air. The waiter's warm greeting appeased me a little, but once we got stuck into the menu we were lost. Rather than ordering a thali plate of mini-portions of different dishes (from £8), our group of 3 wanted to test out a range of dosa and idly (steamed 'savoury cakes', according to Wikipedia). Given the low prices of the dosa (from £3 for a plain pancake to £5 for a chef's special), we weren't sure whether they were meant to be ordered alone or as accompaniments. Most didn't seem to have fillings, so we assumed the latter. In addition to thali and dosa, there were also vegetarian and meat curries, idly, rice and breads on offer, as well as a range of starters. As South Indian food isn't common to the UK, an overview and some ordering guidelines on the menu would probably help: we overheard other groups musing similar thoughts. With some help from our waiter, we opted for 3 different dosas (onion, paneer and lamb), 2 curries (chef's special vegetable and chicken chettinadu) and some idly (jasmine, out of curiosity). Fortunately the wine list proved more familiar territory: a bottle of decent house white set us back just £10.95. After a reasonable wait, our dishes arrived. For a moment I thought I'd stepped back in time and found myself in my school dining hall circa 2000. Served on huge white plastic trays reminiscent of school dinner trays, the presentation of the dosa isn't going to win any prizes. Although inelegant and cumbersome, the trays are fairly practical, with different compartments for dipping sauces. 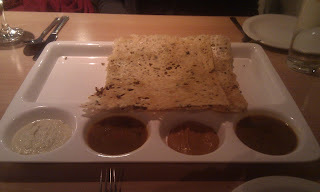 Eating did provide some logistical problems though - did we eat our curry with the dosa? Did we decant it from the dish onto the tray? When it comes to South Indian food, we were all clearly novices. So we did what any novice should do and got stuck in. The paneer dosa (£3.50, unfortunately not photographed) most closely resembled the lightly crispy slices of heaven I'd polished off in Kuala Lumpur. Filled with Indian cheese, it was light and tasty. The other two dosa were made from coarser semolina batter, and were much 'flatter' and heavier. Our unanimous preference was for the paneer dosa: the onion and lamb dropped out of their respective dosa too easily, making eating them a bit of a messy experience (although our technique was no doubt partly responsible). N pointed out that it wasn't exactly 'date food'. The chicken curry (£6) was well-received by N and S; its creamy sauce well-spiced. I was less enamoured of my vegetarian option (£6), which was more sauce than vegetable content, although the addition of some paneer did help to win me round. The portions were also a little on the small side. 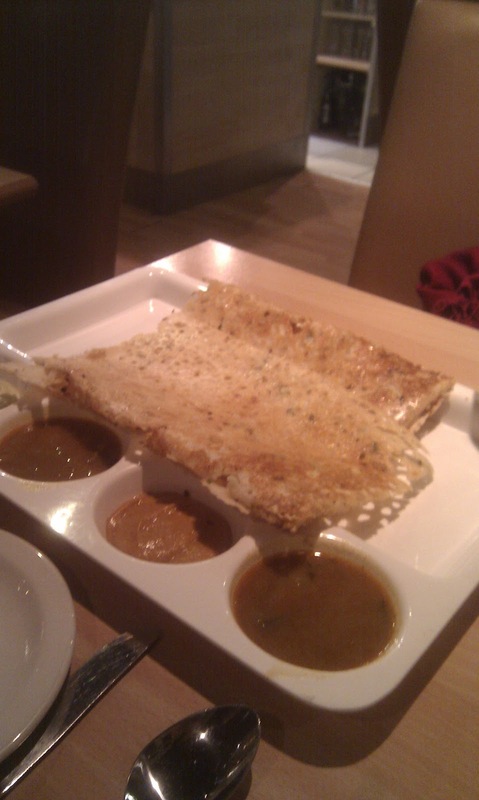 Despite this, we still struggled to finish: the dosa were huge, and the idly (4 for £4.50) were also sizeable. These puffy, glutinous cakes are difficult to describe but I'd recommend trying them: the texture was a delight, even if the jasmine flavour wasn't really discernible. Like our selection of dishes, my thoughts on Trichy Dosa are mixed. I think our experience would have been enhanced by knowing what to order: if any of your friends know their South Indian food, it might be as well to consult them before visiting. Although for the purposes of a review I wanted to sample a variety of dishes, I can't help but wonder whether a thali plate would have been a safer bet for a first visit. Our food was cheap and filling, but it failed to rekindle my daily desire for dosa. Which, wallet and waistline considered, is probably a good thing. I think it's great that Oxford has a South Indian restaurant though (Dosa Park on Park End Street falls into the fast food category). For this reason, Trichy Dosa's a welcome addition to Oxford's dining scene, and if you've never tried South Indian food, I'd recommend a visit. Just be sure to seek some ordering advice. I love this place, the masala dosa (plain pancake filled with potato and lentil curry) is delicious! Its' so exciting to have dosa in Oxford now. Not good enough to give a visit. Worst South Indian food I have ever tasted. 26th Feb 2012 after noon, I thought to treat my family a good south Indian meal. Being in Oxford we have limited options of South Indian food here but have tried least 15-20 south Indian restaurants in England. I have tasted authentic south Indian food in South India. My experience in UK has lowered my expectation here keeping business and clients’ proposition in mind. Food display was not in a good order, there were no name tags against the dishes and serving spoons were missing as well. I tried most of the items in the search of something tasty. Gobi (cauliflower) Manchurian, was mushy, Idlies were hard and not worth to chew more than a bite. To my shock, the waiter was trying to justify Mango chutney for Iddlies and Dosa. Anyone familiar with south Indian cuisine will know what goes with Iddlies and Dosa (Tomato chutney, Groundnut/coconut chutney, and shambhar(spicy Lentil). Dosa was quite oily but eatable. Overall a very bad experience and spoilt a good afternoon and my money. I will advise caution for anyone visiting the restaurant at the current standards. Rather I would advise frozen south Indian food which will taste much better. Customer services – Among the worst I have faced till now. Food preparation – Waiter was trying to justify, Mango chutney for Idli, Do I need to write more? (Shambhar,spicy lantel ,was eatable). I remember a guy in Milton Keynes, who was selling south Indian food on a mobile shop and was much tastier than the food I ate . Overall, a very bad experience. Eating south Indian food here may give a bad idea about south Indian food. Thanks for your comments - obviously people have had very mixed experiences. Anup, it sounds like yours was very negative which is a shame. I can't presume to comment on the chutney situation, but there isn't an excuse for poor service or not labelling the dishes on the buffet.